If you sub scribe by email, you will get all the latest content straight to your inbox, plus a few special extras that are only available to email subscribers. These emails include the whole post so you can read them all in your mail or click the title link if you want to visit the site to leave a comment. You can unsubscribe from this service at any time if you don’t like what you see. You can subscribe by clicking the icon here, or entering your details in the box provided on the sidebar to the right and then confirm your subscription when you get an email asking you to do so. Please note – by registering your email your privacy is assured. I do not use your details for any other purposes than what you sign up for and details are kept private. For those of you familiar with RSS and News Aggregators you can follow the Money Cactus RSS feed by clicking on the orange icon here or on the sidebar (you can read more about RSS here). Simply add the Money Cactus feed to your preferred news aggregator (I use iGoogle) and you’ll get notifications and full feeds every time something is published. I’m guessing there is a good chance you are on Facebook right? 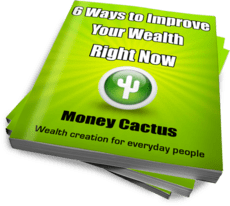 Well if you are, you can head over to the Money Cactus page and like me! (I love being liked). Post notifications get sent to my wall whenever I write something new and best of all we can interact with each other and everyone else that likes what they see here too. Just click the logo here or on the sidebar to go to my page. Depending on how social you are, you might also be on Twitter. If you are, then click the logo here to see my profile and follow if you wish. Notifications are broadcast whenever I write a new post and I tweet other stuff that you won’t see here.